Learn more about NetSuite, read our latest news coverage and see how our customers are transforming their business operations by using NetSuite cloud to run their businesses better and more effectively—from ERP, to CRM to ecommerce. The Retail Doctor: Podcast Episode 204 Matt Rhodus, Director & Industry Principal NetSuite | What Are You Arming The Associate With? Venture Beat: Whose Robot is This and Where Did All the Employees Go? Kochie's Business Builders: Is Direct-to-Consumer the Only Logical Option for Manufacturers? Inside Small Business: Do You Take Risks in Your Business? Squashnet.de: ElShorbagy and Farag Contest NetSuite Final! Squashnet.de: Farag and Gaultier in the NetSuite semi-final! Manila Times: PowerWoman: What does it take to rise in a man’s world? Mynavi: How Did NetSuite Evolve After the Acquisition of Oracle? Diginomica: NetSuite’s Material Change of Control – How Did Oracle Do? SPI Research: SPI Review of NetSuite’s SuiteWorld 2018 — Ready, Set Grow! RSR Research: NetSuite: All Grown Up? BCN: Keynote Lecture, ERP Also Uses AI as a Standard, Founder · Goldberg's "Oracle NetSuite"
Which-50: Oracle and NetSuite Are Happily Married. But What About Bronto? e-works: What Sparks Will Oracle Have When Colliding with NetSuite? Innovation and Practice: SuiteWorld18 is Coming, Let’s Experience the Energy and Passion at the Event! TechTarget: How can Midmarket Manufacturers Get Started with IoT Projects? The Manufacturer: Can Manufacturers Overcome UKs Productivity Gap? Diginomica: 2017 Wasn’t A Fun Year for Enterprise Software Buyers. Maybe 2018 Will Be Better. ITPRO: Will the Cloud Help Your Business Survive? Enterprise Times: Is the Key to Internalisation Watching TV? Enterprise Innovation: E-commerce: How Can SMBs Meet Shopper Expectations? ComputerWeekly: Can Cloud-Based ERP Buy You Business Agility? 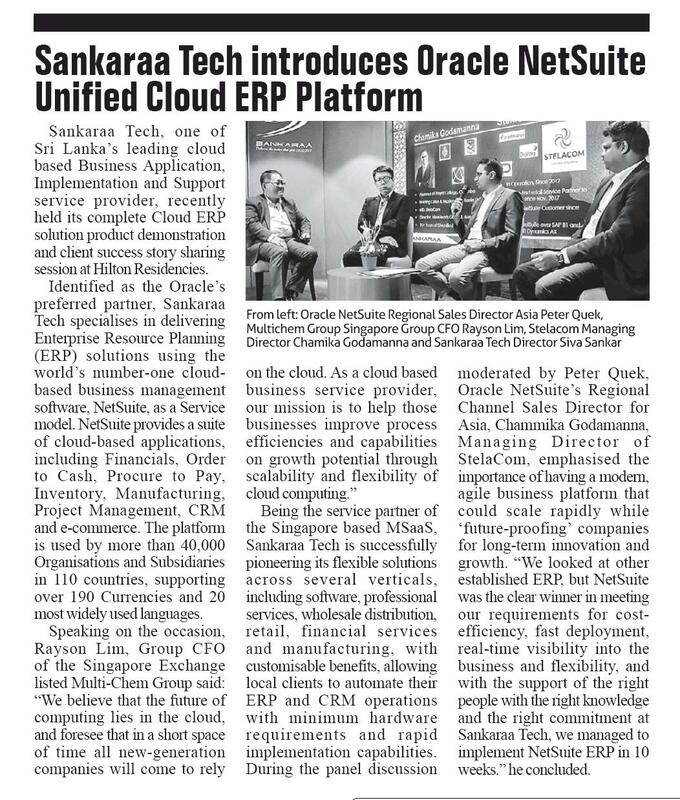 TechTalkThai: NetSuite Interview with Cloud ERP Solution to penetrate Thai Market with Concept "Everything in One"
Enterprise Times: Is Wholesale Distribution Burying Its Head in the Sand? Computerweekly: Is Cloud ERP Software Ready for Prime Time? CMSWire: What Happens When IoT, Big Data and Retail Location Systems Meet? CFO Innovation: The Cloud Reaches Critical Mass in Accounting and Finance. Are You Ready? ITPRO: Editor’s EYE: A Bitter Sweet NetSuite SuiteWorld? CloudPro: View from the Airport: A Bitter Sweet SuiteWorld? Enterprise Irregulars: NetSuite under Oracle: More, Better, Forever? Lifehacker: How Do You Choose Business Software? EnterpriseZine (Japanese): Where is NetSuite Reborn as Oracle’s Global Business Unit? Enterprise Times: What Powers the Office of the Future? Bob Scott’s Insights: SuiteWorld: Different and the same? PC: NetSuite Decade Ahead of the "Digital World and Cloud with 40 Thousand Customers"
Enterprise Times: Is Oracle Evolving? Mint Jutras: Does Oracle’s Acquisition Mean, More, More, More for NetSuite?